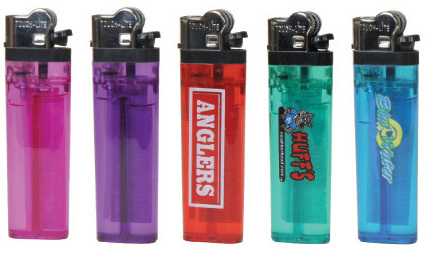 Keep your marketing campaign at everyone's fingertips with these customized disposable lighters. Imprint your company name or logo on the side of these lightweight standard flint lighters that feature rounded edges for a comfortable grip. They are approved by the CPSC, measure 3 1/8" x 7/8" x 7/16" and are available in translucent shades of blue, green, pink, purple, red, and yellow.